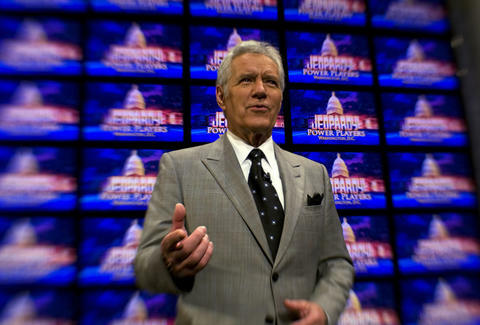 For 34 years, Alex Trebek has provided America with answers, been firm but fair, and hosted Jeopardy. He's not unlike the nation's upright but mysterious dad. In all that time, Trebek has rarely given any indication that he's anything less than one of the most beautiful, pure, silver-haired gentlemen to walk the green Earth. But everyone's parents have a past: In a recent interview with the Daily Beast, Trebek revealed that he once ate six pot brownies and promptly passed out for like two days. As Munchies points out, he's actually mentioned this experience before, to Howard Stern of all people. (It's worth listening to the interview to hear how the Jeopardy host over-enunciates "hash brownies.") In that version of the story, he says he was in bed until the following Monday, but we may never know the truth. He also admitted to one other experiment with pot: Years later, a friend of told him marijuana might help treat arthritis in his shoulder. "It didn't. And so I didn't continue smoking," he told Howard Stern, again using the sound, assured judgment we've come to love him for. "To me, drugs are highly overrated. I mean, why do it? Be confident in yourself. If you make mistakes, live with that," he explained to Howard Stern. "Why do you need to do this other stuff that's gonna take you -- where? To a different world? You're gonna be more attractive? Do you think?" James Chrisman is a News Writer at Thrillist who thinks Trebek was a little harsh at the end there. Send news tips to news@thrillist.com and follow him on Twitter @james_chrisman2.